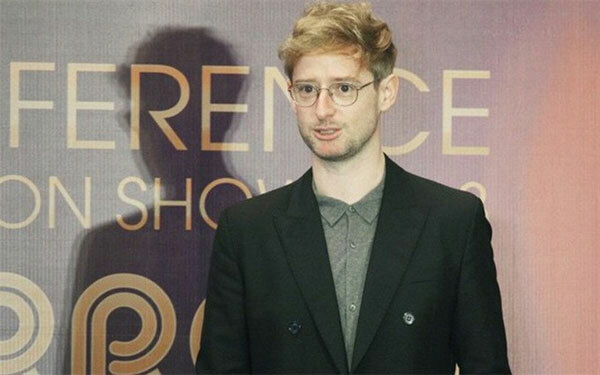 VietNamNet Bridge – Le Huong chats with Graeme Armour, a designer from the UK, who has recently teamed up with domestic fashion brand IVY moda at their Autumnl-Winter fashion show. A graduate from the Central Saint Martins Art School in London, Armour has worked with huge names in the fashion industry like Alexander McQueen, Emanuelle Ungaro and Karl Lagerfeld. A finalist in Colin McDowell’s Fashion Fringe, he was named Scottish Young Designer of the Year at the Scottish Fashion Awards in 2008, judged by vogue.com editor Dolly Jones, Hilary Alexander and the Hon Daphne Guinness. Is it your first time co-ordinating with Vietnamese designers? What are you thoughts of their work? Yes. This is the first time with Vietnamese designers and the first time I have been in Vietnam. IVY moda is a great brand with a steady customer base. I had knowledge of what IVY has done so far. I think it is an easy process to work with. They have a potential growth, international growth and they are very open to creative products, which make them more relevant for the market. What were the difficulties and advantages of working with them? How have you overcome the obstacles? One of the difficulties is the language but Ms [Hoang Kieu Van] Trang [the Director of Design for IVY moda] and myself speak the common international fashion language. That’s a very big bonus. Obstacles are the fearing that we are doing things out of the norm, just small things but it is still fearful. When we did the runway collection it is different to designing a commercial collection. All the pieces in the collections are staying in a modern way. The pieces themselves are very very simple, not hard to wear. Besides, in terms of doing a show. In the west less is more. But here in Vietnam, it tends to be more is more. So they sometimes try to highlight the number of designs while to me it looks good because the clothes do the talking. In terms of working on products, I have put my faith in Ms Trang. We communicated mostly through email and when I came here, everything is almost ready for the show. Could you tell me the trend of the world fashion this autumn-winter? A lot of trends are dictated by this or that magazine and people, who like to follow something trendy. But for me, having stay with a brand is more important because stay will always last long while the trends come and go. I think the trend I look for is a kind of task by the ones who do an amazing job, they identify their customers, their flashcard collections, the products that they really sell and make the money, updating their data. That collection is impressive to me like a very solid collection both commercially fashion forward. That kind of brand sums up the season for me because it looks really fresh. In terms of brand trend I would choose the one which captivated everything that people want from fashion at the moment. I do love brands using traditional fabrics to look elegant, feminine or masculine. There are a lot of lovely kid fashion trends, too. After this collaboration with IVY moda, have you got any plans to further co-operate with Vietnamese designers or companies to serve Vietnamese customers or introduce the fashion in other countries? If yes, how? If IVY moda wants to work with me again, I’ll work with them again because I have a commitment to them I feel. I also want to collaborate with more Vietnamese companies in the market and offer hopefully my collections as well here and let people see the opportunity to move the fashion forward in Vietnam. And I do with consideration of the brand and believe it has to be in my way. During this week I have to emphasise on runway collection and I’m trying to look for a product that has visual representative as I mention before. So I would love to work with more companies from Vietnam fashion and other countries, too. It depends on the brands whether they want to work with me, to develop their collections in international market. If they have the scope, manufacturing, resources, I would love to help. Please tell me about your present job in the UK! I have a consultancy company in the UK. I have helped companies in London, Italy, and Germany. I offer my services to customers in terms of creativity I have, the commercial experience I have. I’m very busy with commercial clients currently. I have co-operated with Alexander McQueen, Emanuelle Ungaro and Karl Lagerfeld as well as Adidas, A/A, Rita Ora and MARYLING. Now my commercial clients get less demanding as I get older and prefer to spend more time doing things for myself, with my friends and family. I love chasing fashion more in the rest of my life as fashion-destinate.